The nursery bedding arrived this week- yay! It's all coming together. I have the major stuff taken care of, and now get to focus on the little things like pacifiers, receiving blankets, onesies, bibs, and diapers, to name a few. I still need curtains too and plan on making a trip the cloth store mid-October, unless I find a bargain somewhere that happens to match. I'm relieved to have the majority of big expenses over with but now we're burdened with financial woes in the aftermath. After mortgage, a Visa bill, car payment and some monthly expenses, we'd eaten through over 2/3 of Rusty's paycheck the day after it was deposited. ouch! So we're back to limiting our expenses until we get caught up. To make matters worse, I'm not very good at adding receipts to our electronic ledger so it kind of crept up on us. I have two checks of income coming in this month, which will help, but only a little. We went to the grand opening of a new St. Vincent de Paul thrift store today. My friend Dorothy has been busting her rump as project manager (that's the only title I know to describe her position though it may be inaccurate) for nearly two years, first helping to raising funds during the capital campaign, then pulling the pieces together for staff, facility, merchandise, donations, etc. They did speeching, ribbon cutting, free food and drinks, and even had a mariachi band with a Latino Elvis on a stage. I found a boy baby doll for Josh for a dollar. He was so excited to have his baby doll. This evening we showed him how to properly hold, burp and kiss his baby doll. Then Rusty took it a step further by putting the doll under his shirt to mimic breastfeeding. Josh thought it was just a clever game of hide-the-baby. That's what Josh has taken to screaming when he thinks we're going to take something away. Even if it clearly isn't his. Like the lawnmower. Tomorrow is my medical research appointment. You may recall from previous postings that I've enrolled in a pre- and post-natal medical research through Presbyterian Hospital of Dallas. Yesterday and today I was on a special diet provided by the researchers to regulate and limit my intake of sodium, potassium, and general yummy fatty foods. I have a profound respect for anyone on a strict diet. It's very difficult not to cater to the smell of popcorn or pizza or cookies or invitations to go out with friends. In my opinion, they don't feed me enough. For the past two days the diet has just satisfied a feeling of hunger, but nothing more. I never get that full satisfied feeling after a meal. Tomorrow morning, after I take Josh to school, the research team will draw blood, make me do breathing exercises, will look at my heart, tilt me on a bed, take my blood pressure a lot, and test some nerves in my legs. After the three hour test I'm free. I plan on packing a goody bag to take with me for afterwards: a banana, Oreo cookies, trail mix, and maybe a PBJ sandwich. I'm hoping the check from the research will be in by mid-October. I have a hair appointment to go back to brown (bye bye blue) on the 17th and would like to pay for that myself. Michelle of Bella Designs did a great job of hand painting these adorable bumble bees all over the nursery walls. These match the nursery bedding due to arrive next week. All we need now is a crib and dresser to really make the room complete! We think Josh has learned the word "crap" from Rusty. He started saying crap this evening and repeated the word over and over and over and over and over and over and over and over.... He said it with various tones of voice, with a whine, with conviction and with all sincerity. We tried to change the subject, to engage him in another activity, to peak his interest in a new word. But all we got back was crap! I scowled at Rusty only briefly. I'm guilty of another word myself. Friday I discovered a sippy cup of water spilled in a plastic shopping bag of new socks I had just bought. Without thinking I exclaimed "ah damnit" in my agitated tone. Then, yes, Josh proceeded to say damnit too. He only said it twice but it's only a matter of time before he damns something. Rusty & I spent the second half of Sunday sans Joshua. The in-laws took Josh to the Plano Balloon Festival while we ran a couple errands, went to dinner and visited a couple friends briefly. I got a sewing machine from Anne (thanks!) and a dinner certificate for Steve Fields- yum! It was the time with Rusty that I appreciated the most. It energized us being able to relax and focus on loving each other instead of multi-tasking and keeping up with a two-year-old. Love the kid to death, but I also love the little adult time we get these days. Newby II has hiccups right now. It's such a weird feeling, those little thumps. This morning Josh bent over to pick up a toy and farted in the process. It sounded like a muted machine gun. Then he stands up, giggles and says "I farted! hahahah Fart fart fart..." Such a boy! He's counting better these days although he stills skips 'two' sometimes. Actually he'll 'two' and any other sequence of numbers he wants. For example, this evening he was racing from the front door to the living room window. At the door, he readies himself by counting then shouting Go! Except he counted like this: one four five six, GO! - one seven eight nine ten GO! - one three four GO! My midwife appointment on Thursday went well. Baby measures a healthy growth, my blood pressure, protein, glucose, weight, all those vitals are healthy and normal. 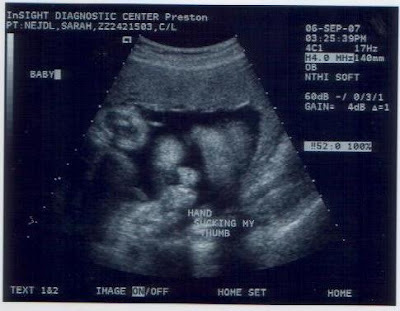 Baby's heartbeat is fast and strong, just like Josh's was. We talked about the low lying placenta. It has grown upwards and is now 4.7 cm from the cervix- which is great news. There are now no complications going into another natural birth. The next appointment will focus on our birth plan and preparations so Rusty will be there along with Melissa. In other news, Rusty & I are working to pick up another client to design and host his website. He has a new business (that I can't talk about yet) and wants to roll out with selling it this Fall. We're waiting to hear from him confirmation to begin. Additionally, another contact, Rusty's boss's husband, wants to barter a custom cabinet he built for us in exchange for a website and some hosting. Since he already has the cabinet made I'll probably begin sketching ideas for him next week. Speaking of sketching, the nursery will get it's final wall treatment on Tuesday- yay! Michelle of Bella Designs will come in the morning to paint the bumble bees on the walls. Now all I need to get is furniture, bedding and curtains, and the room is complete! It's my birthday- I'm 31 today! yay! I didn't do anything special for my birthday today except stop for a slice of cheesecake in the afternoon. Rusty and I are working on plans to go to the movies this weekend to see Across the Universe. The change in season has caused Josh's nose to be "messy", as he puts it. He woke up several times last night saying "nose mess" and "nose hurts". I'm guessing the sinus pressure is what hurt. Aside from the discomfort, some dripping and the occasional sneeze, he's fine. Here's Rusty at home. Yes, he's almost always in the office at home. Me & Hannah Poole- She's due in 3 weeks in this picture. The brown walls in the loft before they got painted. Southern Painting painter dude doing his thing. From brown to blueish-purple, green and yellow walls! The loft with our fancy custom curtains made by a neighbor named Jenny. She did a beautiful job! I tied one up to show the difference in lighting and effect. Another curtain graces the top of the stairs (also made by Jenny) and look great against this new green. The nursery. Or what will be the nursery. The lighting isn't great in this shot. The upstairs is a much happier place now. We took Josh to the Jimmy Porter Park in Carrollton after dinner to let him run around and release some energy. The park has been updated since we were last there- more than two years ago! There's re-enforced banks on the creek, mini waterfall to control flow, an official brick crossing path, and -gasp!- a paved parking area. The grass was shoulder high to Josh in some areas but he didn't mind. We got our upstairs painted and I LOVE it! I'll post pictures tomorrow or Monday when the walls are dry enough to move stuff back. The only unexpected snag is the nursery walls are a bit more purple than blue-purple. I even put in Reveal light bulbs. Maybe some blue tinting on the light shades will help. Once the room fills in with furniture and other colors perhaps it won't be so nearly girly. Our house getting painted today! I'm so excited to see what things will look like with our new colors. The fumes are a bit strong so I'm chillin' downstairs today. I'll take pictures when it's done for everyone to see on our online photo album. So back to the shopping. For any mom who hasn't gone to a consignment sale, an organized one I should add, she is missing out on good deals! I found some toys for Christmas, a Joovy stroller for $75 (which I need to clean up today), a glider with a nursing stool for $40, some Fall/Winter clothes for Josh, new shoes for Josh, baby clothes for Newby II, and a baby sling for $20. I won't say how much I spent but it was all way less than it would have been retail, especially the stroller, glider and baby sling. The only thing I'm still searching for is another baby monitor for the nursery. I plan to volunteer and shop Divine Consign next week in hopes of finding one. I saw several yesterday but not with two speakers. There were tons of moms at the pre-sale. I heard that about half of the total sales are generated during the pre-sales. I got in on the first pre-sale since I volunteered to work 10 hours. The consignor pre-sale started at 6pm and when the moms filed in at 6:00pm, there was a slight breeze in the room of moms dashing around and rushing in. I expect Divine Consign to be bigger and busier based on how it was last year. My birthday is next week. For the first time in years (or ever), it doesn't feel like such a big deal. I guess turning 31 isn't a big deal in of itself. Last year I dyed a streak of hair blue to mark my statement against feeling old. I don't feel old this year at all, though I do plan to turn the blue back to brown at month's end. I don't expect to have the time or energy to maintain the blue once Newby II is here. Speaking of, he's awake now thumping around. My next midwife appointment is next week, the start of my 33rd week. This week I'm 32 weeks, the beginning of my eighth month. Two websites to check out for the expecting mom is i-am-pregnant.com and Storknet. According to these sites (collectively), he's sleeping 90-95% of the time, weighs at least 4 lbs. (my last ultrasound indicated 5.5 lbs. ), has all five senses, toenails and hair are growing, and by next week the average weight gain for the mother is 22-28 lbs. There's a thunder storm this morning with the works- lightening, thunder, gobs of rain. The morning started out fairly typical with Josh up right around 7am ready for his diaper change and breakfast. After his bowl of cereal, I go upstairs to shower while he's downstairs watching Bob the Builder. So far, this is still normal. Usually Josh follows me upstairs eventually. I finish and check on him. He's playing with a toy and watching the start of Sesame Street. I go back into my bathroom to pull up with my hair and finish getting dressed while Rusty is showering. I was upstairs the second time for maybe 5 minutes. As I was on my way downstairs, when I see the back door open. Still, this is isn't completely unexpected since Josh has on occasion helped himself outside to play. I'm thinking "Oh geez, he's playing in the rain and getting muddy." As I approach the back door, I see the gate to the driveway open. Uh-oh. This isn't good. I check the backyard and downstairs and realize- he's missing! I yell to Rusty what's going on then grab an umbrella and start my search up and down the alley. No Josh. Rusty comes out in shorts to look while I call the police. At this point, we estimate he's been outside 10-15 minutes. I'm not panicked at this point, just level headed and looking. No Josh. We switch- Rusty stays in the home while the officer and him double check the house and I walk up the neighborhood. No Josh. I look in the drains where water is rushing in and have this thought what if he was swept into the drain. No Josh. Now I'm starting to have fears of him drowned, kidnapped, lost, hurt... No Josh. I tell the neighbors on both sides of our home to keep an eye out. I search the front of the neighborhood again when a black truck pulls up and a man asks me if I'm looking for a little boy. I was relieved and emotional all at once. I'm so glad he was picked up by a Good Samaritan. He explained that he saw Josh wandering in the street headed towards Rosemeade. The neighbor had been driving around looking for someone looking for him. "He's a very sweet little boy and I can tell he's well cared for." I get the driver's name, thank him repeatedly and take Josh inside. The policeman takes notes, I change him out of his sopping wet diaper and clothes, and we evaluate how he got out and how to prevent it. On a normal day, the gate to the driveway is closed but we think the storm tripped it making it open. We had the back door locked but we didn't have the flip latch locked. Also, we didn't have our house alarm set which would have notified us of the door being opened. I'm so thankful he's not hurt and wasn't missing for a terribly long time. In that short time where I began to panic and imagine the worse, I felt like a statistic. So many children go missing and I brush off those stories. They were negligent parents. The kid should have known better. I won't happen to us, we lock our doors and have a gate. It happened to us for one hour. And one hour is all I need to learn my lesson. Never underestimate your toddler's abilities and never trust that they will OK alone in the home. We changed Josh's bedtime routine hoping it will help him sleep sooner and more independently. My goal is to get him to either fall asleep within 30 minutes of lights out or to stay in bed when we walk away from outside his room. Old routine: bath, 10 min. of TV, asthma medicine, brush teeth, read books, say good night then sit outside his door (mostly out of sight) on a stool with a dim hall light until he falls asleep. New routine: TV after dinner, asthma medicine, bath, brush teeth, read books, say good night, play a CD of soft music then sit outside his door (mostly out of sight) on a stool with a dim hall light until he falls asleep. Mainly the music and the timing of TV is new. We're giving this a few days to see if it helps. Eventually I'll drop the stool sitting too. Tonight's music choice is Matt Musselman's Dialogue, soothing classical piano music. Tonight he's out in less than 20 minutes. Go Matt!! The spring on the garage door snapped yesterday as Rusty was coming home. Josh was coming inside with him when it happened so of course he talked about the 'boom' and the 'sound' and 'garage door' and 'it broke' and 'wow!!'... He even talked to pop-pop and grandma on the phone about it. Midnight snacks and naps are becoming more frequent. A typical night snack is a bowl of cereal or piece of fruit. I also tend to take a nap almost daily ranging from a 30 minute snooze to 2 hrs or more, especially if Josh is frequently up at night. I remember napping in the first pregnancy too around this time of gestation. Luckily I'm at home this time instead of cat napping on my lunch break in the office. The usual yoga instructor is out on vacation in Ireland. I've come to prefer her style the best having the right mix of stretching and breathing, while not over working us mega bellied mamas. The substitute today was brutal. She didn't have the "isn't it wonderful to be pregnant" mat-side manners. In fact, many of her stretches were difficult to do even without a big belly. My opinion isn't helped by the fact that I was positioned right in front of her (or behind her when she faced the wall) and nearly had a foot in my face several times. That technical issue aside, I was so tempted to inquire what days she teaches, but resisted for fear of seeming tacky. Here's the baby! And he's head down!! yay! The sonogramist confirmed that the gender (still a boy), estimates the weight at five and a half pounds and suggested an early due date of October 26th- which I laughed at and said "yeah right". (They don't really know by looking at a baby's measurements.) I inquired about the low lying placenta and was informed she was not at liberty to say. Why is that, I asked. Because of liability. Huh. She goes on to say that if she told me a bit of information that I misunderstood or misheard or misinterpreted in some way, patients were known to get upset, doctors get upset, her boss gets upset... essentially, they would rather the doctors interpret and communicate the sonogram results to the patient than the sonogramist. Whatever. I'll find out at my next midwife appointment (which happens to be on my 31st birthday) whether or not the placenta is growing up and outward enough to not be a complication. Midwife appointment went smoothly this morning. I scheduled myself for another ultrasound later this week. New pictures of our weekend trip to Boulder, CO are now posted online in our photo gallery. Josh learned a new skill last week: he can now open the refrigerator. I moved his milk cup down to a shelf in the door where he can reach it whenever he wants. I have current maternity pictures on the last page in a folder called Newby II. Sometime in November I'll rearrange the gallery to include our newest member keeping Josh's pictures in place. New pictures will be added to this folder periodically or monthly. September is looking to be crazy busy for us! My calendar on the fridge is filling up almost daily with various events such as volunteering, appointments, yoga classes, playdates and scheduled events. So far 6 weekdays have nothing scheduled or planned yet. I'll try to keep updated with the blog this month, but no promises! Beautiful Colorado! We arrived yesterday after a relatively short and somewhat painless flight. Short being less than 2 hours on the plane, and painless being Josh's willingness to not run everywhere or tantrum. He was fine on the plane until the landing when he got cranky then fell asleep. It helps that there were 4 other families traveling with kids. We ate a late lunch at Efrain's with my dad then convinced Josh to nap for an hour. That held him over for the evening allowing us to wash clothes and eat at my aunt's condo. He's now acclimated to the change in time zones- he woke up at 7:05 this morning and went down for a nap at almost noon. I'm rally grooving on the climes. It's a good 10 degrees cooler than at home now- yay! We spent the morning wandering around the Farmer's Market and Boulder Creek Festival. If it weren't for my restraint, I could easily spend all our cash at the market on foods and stuff. Today I bought 2 white peaches, 3 carrots, 3 prune plums, a bag of flax seed crackers, a jar of salsa, and red stone earrings. Except for the earrings, everything is organic and super yummy. After Josh gets up, we may swing by my grandmother's apartment before going to a patio party at my aunt's. My grandmother Betty is suffering from lung cancer (since 2003) and every update I hear sounds worse and worse. She's miserable living with the medical treatments and reduced lifestyle. It's a grave reminder of how smart I was to having never smoked cigarettes despite growing up around it. In some sense, I want Rusty to get the clue too before it's too late. The sooner he quits in life, the better chance his body has of cleansing itself and avoiding his own lung cancer. And the better chance we have to teach our kids to do the same.